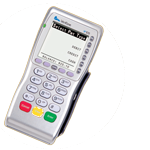 The Vx 670 is one of the smallest all-in-one wireless handheld payment device available. This terminal is also PCI PED approved and is both sleek and secure. The largest user interface comes in the smallest form in this rugged device that is designed for real world usage. Download PDF of the VX670 Terminal. The i7780 is the ideal Pay@Table solution. 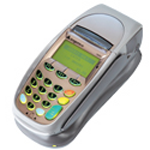 Seven Ingenico i7780 terminals can opperate at once using only one common communication base. The i7780 is a high-speed enabled portable transaction terminal capable of serving a coverage range of up to 100,000 sq. ft.
Download PDF of the I7780 Terminal.